When the queen of Sheba heard of Solomon’s fame, she came to Jerusalem to test him with hard questions. Arriving with a very great caravan—with camels carrying spices, large quantities of gold, and precious stones—she came to Solomon and talked with him about all she had on her mind. Unspecified in the text. I have set the scene in the late morning. The sun is almost directly overhead. 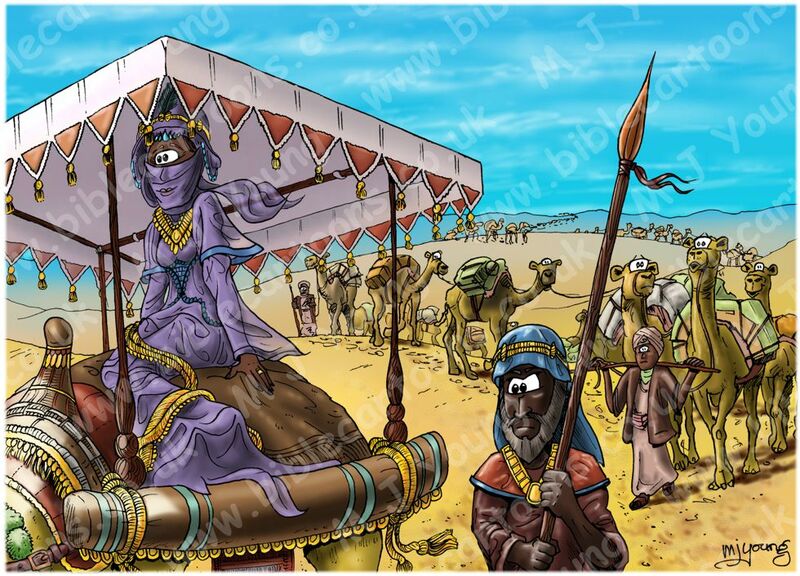 The queen of Sheba is riding on a soft cushion-like saddle on a camel. One of the queen’s personal body guards can be seen walking beside her, carrying a spear. Several camel drivers & many camels follow behind the queen. There is some debate about who the queen of Sheba was. many countries claim her as their queen. She may have been from the land of the Sabeans (see Job 1:15; Ezek. 23:42; Joel 3:8) in southwestern Arabia. The queen travelled over 1,200 miles to meet king Solomon, no doubt having heard of his great wisdom. A talent was about as much weight as an able-bodied man could carry, although it seems that most countries had their definition of the weights they used, so it is quite uncertain as to exactly how much gold the queen of Sheba gave to Solomon. 120 talents of gold may equal about 11,000 pounds, 4,000 kilograms or about 4 tons (4.5 metric tonnes)! The queen’s camel caravan brought spices, gold, and precious stones as tokens of her friendship & no doubt as a means of securing trade between her country & Israel. The camel caravan must have been very long & composed of hundreds, if not thousands of camels & /or other beasts of burden, not to mention a large soldier guard for the queen, plus porters, camel drivers, & other members of the queen’s retinue. All would have been arranged & dedicated to the single task of ensuring the safe arrival of the queen & all of her precious gift cargo. I don’t know what animal the queen actually rode on, if any, during her long trip to Israel. I have her on the back of a camel, though I believe camels are not the easiest animals to ride, because they sway a lot. Perhaps the queen rode a horse, or some other beast of burden. I have shown her sheltering beneath a canopy, held up by a system of wooden poles, on her camels back, like a great portable parasol. I have seen photographs of similar camel saddle arrangements, so it is not impossible to imagine her travelling like that.